Prince Kuhio Beach is a small, narrow beach that backs up to Lawai Road on the south shore of Kauai. It is also next door to the Beach House Restaurant (seen in the above picture) so it is anything but secluded. However the beach is popular because it offers great snorkeling and oportunities to swim with sea turtles that live along the shore. The beach is protected from wave action by an offshore reef and lots of people staying at the nearby condos use the beach and the lawn in front of the Beach House Restaurant for catching sun and for watching sunsets. Three very popular surf breaks are just beyond the reef: PK's, Centers, and Acid Drops. You can see some great surfing here, especially during summer months when the south shore generally gets bigger waves. Competitions sometimes draw big crowds. However, these surf breaks are not for the novice because of their proximity to the shallow reef. Prince Kuhio Beach has an identity crisis. It is sometimes referred to as "Beach House Beach" because of the restaurant next door. But more often it is misidentified as Lawai Beach because it is located across the road from Lawai Beach Resort. However, Lawai Beach Resort was named after the real Lawai Beach which is further down the road (west) in the Lawai Valley and inside of Allerton Garden. Incidentally, the real Lawai Beach is often referred to as "Allerton Beach." Access to Allerton Garden and this "public" beach is by paid tour. 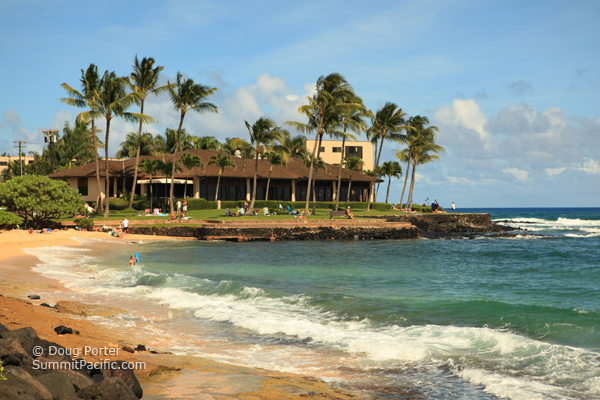 More must see Kauai Beaches. Kauai Vacation Rentals on Lawai Road include, Prince Kuhio Resort across the street and oceanfront Kuhio Shores on the other side of the Beach House Restaurant.